﻿ South Point Hotel Casino and Spa, Las Vegas (NV) | FROM $57 - SAVE ON AGODA! 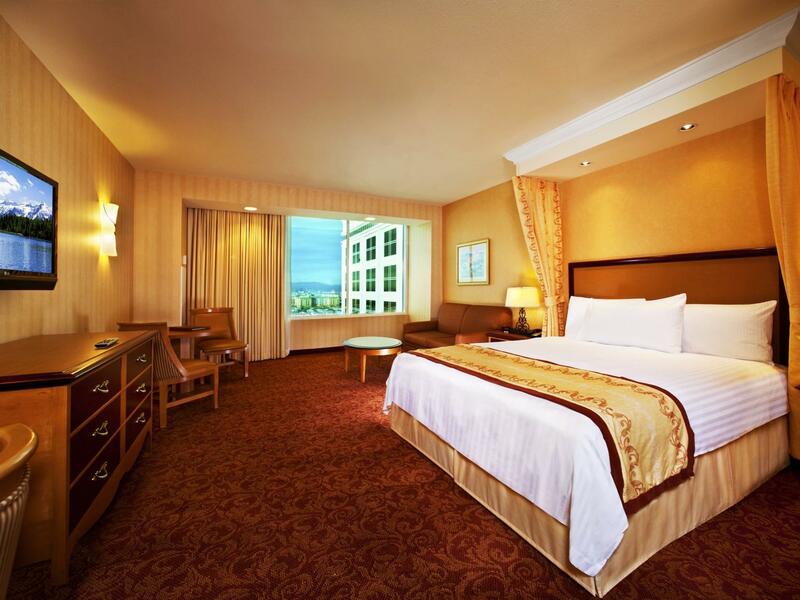 "Overall it was a good stay and we will be customers again in..."
Have a question for South Point Hotel Casino and Spa? "The Garden Buffet was fantastic and the pool area was large and a really nice place to escape from the very busy casino." 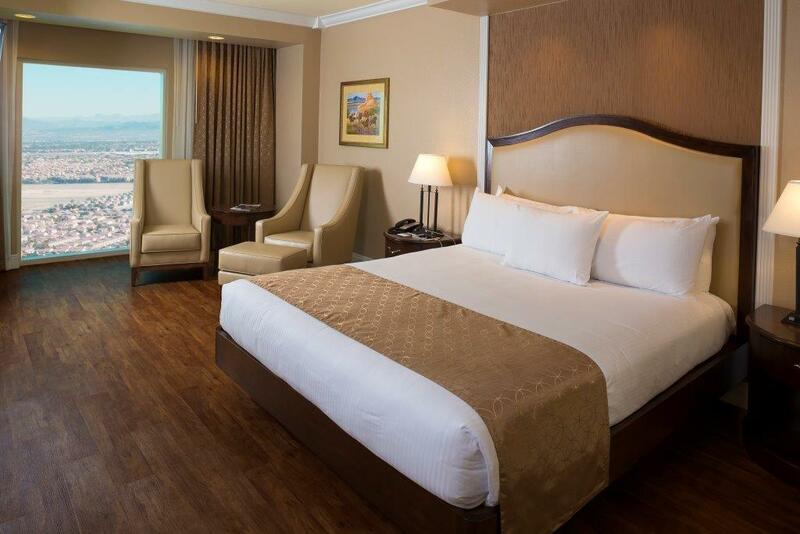 "Meanwhile, the Souh Point has everything you probably came f..."
South Point Hotel Casino and Spa is a world-class hotel perfectly located in the heart of premiere southwest Las Vegas valley and just minutes away from the famous Las Vegas Strip. It is ideal for guests who seek leisure time and first class service. The hotel offers various choices of restaurants to enjoy a variety of meal choices and provides the foremost culinary experience to all diners. There are many activities guests can enjoy, including a 16-screen Century Theater movie complex in-house, and bowling at the South Point 64-lane Bowling Center, a state-of-the-art facility offering a main center aisle with 32 lanes of bowling on each side. Tables are equipped with touch screens so everyone can keep track of the game, or enjoy a cold beverage without missing any of the action at a bar adjacent to the lanes. South Point Hotel Casino and Spa also has a fabulous 400-seat showroom that features headliner entertainment and dancing to live bands on weekends. 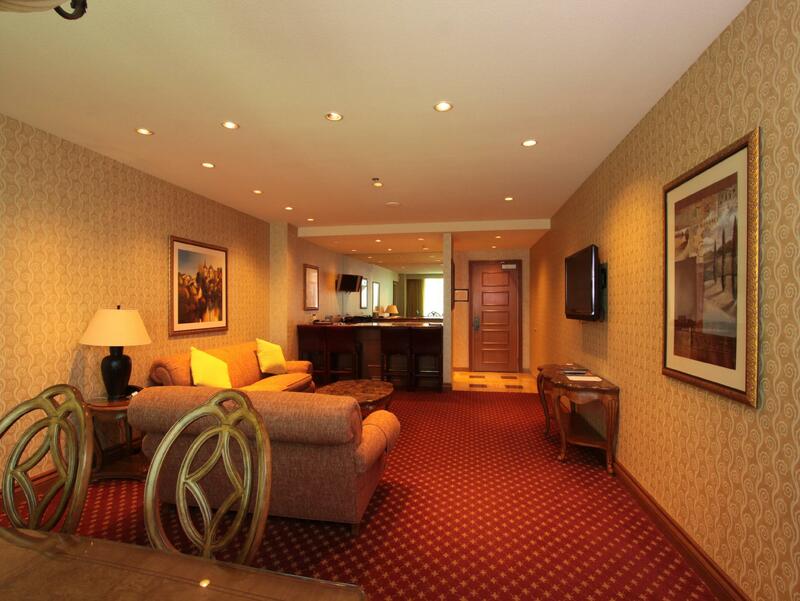 It’s no wonder guests keep returning to South Point Hotel Casino and Spa. Smoking in a non-smoking room will result in a cleaning fee charge of USD 200. I love this property. They have a bowling alley, movie theater, 11 eating places, swimming pool, spa, Arena, convention center and gambling. The fact that its 7 miles from the strip doesn't matter when you have all that stuff there. There is a free airport shuttle that is fast and spacious. The rooms are lovely and recently updated with very comfortable beds. Room service was fast and decently priced for room service. We had an unfortunate incident in the middle of the night (toilet clogged) and maintenance was at the door in less than 5 minutes. Keep in mind this was 3 am when this happened. The bowling alley had 60 lanes and was amazing to bowl in. The movie theater had several theaters and had all the new movies with very comfortable seats. I wish they would change smoking in the casino because you walk through a cloud of smoke when enter every time. This Hotel has it all, for the Price you get a Big Nice Room with Free Wifi and Nice T.V, you also get a coupon book for 50% on their Buffet and other goodies. If you want to get away from the Busy strip, this is a great Choice and their Price is very Reasonable. If like to Play Poker, they have a big Poker room with Cash games and Tournaments. They have good places to Eat for Late night especially their Grave Yard special from midnight to 6 Am, $5.00 for Steak and Eggs not Bad. Highly recommend this hotel, been here 3 times and always had a great time. The rooms are large, clean, and modern but no fridge. Shower was one of the best. Get a room above about the 7th floor if you don't want a view of a wall - I was on the 8th floor and could just see over the parking garage roof. Last time I was lower and could only see a wall. Hotel has everything including good restaurants with reasonable prices. Beverages at the bar are about half the price of strip hotels. Gift shop has the best prices for alcohol I have ever seen. Seriously prices are as good as Costco. Large racebook and sportsbook, Steak and Shake near the books, theaters, equestrian center, bowling, etc. This place has it all and the value for your money is really good. Drawback for some is that it is located 4 miles south of the other strip hotels but it is just off the freeway (15), has a free shuttle to the strip, free airport transfers, and best of all if you are driving from Los Angeles you save 20 minutes going and returning. I had a hard time getting a room up high away from noise because I book From AGODA. Manager at reception gave me a very hard time stating that 3rd party booking rooms were not available up high. So Agoda guests get the poorly located rooms vs people that book direct. Stayed here many times as we like to be away from the hustle and bustle of the strip. Good clean room although the pillows were really uncomfortable this time. Plenty of restaurants at reasonable prices. You will notice most of the guests here are local because the hotel is away from the Strips. But this is what we love. The price is cheaper but the hotel offer a great bargain! 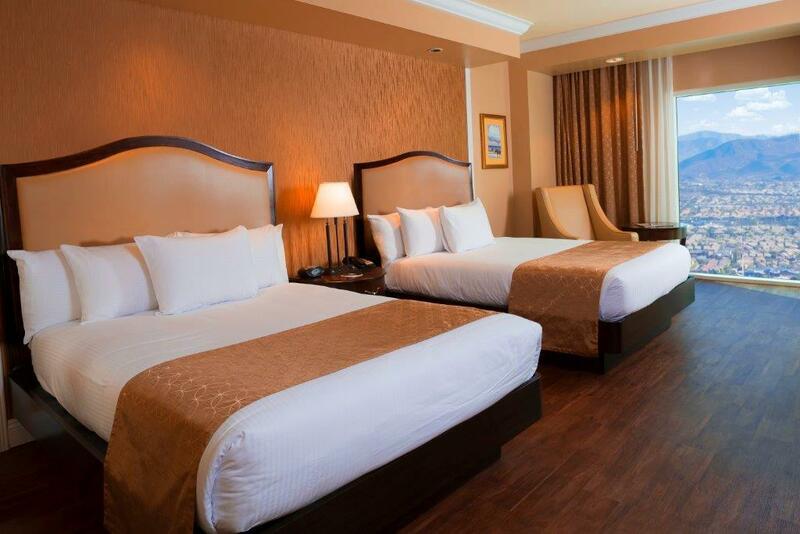 Big spacious room, probably double size of your normal hotel room in USA. Great facilities for you to stay in for few days without having to go out of the hotel. Thumbs up! This place was recommended by a family member, and I’m glad we went. It is not on the strip, but there’s a shuttle that can have you there in fifteen minutes. Meanwhile, the Souh Point has everything you probably came for: casino, nice selection of restaurants, good rooms, pools, etc. And the price was unbeatable. Their staff are also great. Friendly, professional, and helpful. We only had a night in Vegas but this place made it totally worthwhile. Good size room with king bed, sleeper sofa, dining table for two, full dresser and still walking room. Bathroom had separate toilet as 2nd shower area from sink. No view, but we weren't in the room long enough to see one. Bed was very comfortable! I recommend this hotel! We really enjoyed our 3 night stay. There were plenty of restaurant choices that will appeal to different budgets. (loved the $4 steak and eggs after midnight) We had great fun bowling. The casino, however, was a bit too smoky for us. The room is very bright, clean and spacious. There's a small set of sofa in the room, and lots of electrical power points available which make it very convenience when charging your devices. And free Wifi is a plus. However, it is rather far from the Stripe, so you need to take taxi to move around which can add up to be quite costly. Enjoyed ourselves. Much more laid back that anywhere close to the strip. Staff were great. There is a lot to do without having to go anywhere else. The value was great. Could have better pillows and pillow case. Pillow case is rough and pillow is of low quality for a resort hotel of this level. nice stay, off the beaten path but a great getaway. Staff at reception very friendly and helpful, lovely clean room overlooking the mountains, best buffet in town for the price, we have tried quite a few in Vegas, at the same kind of price. The hot tub and pools are lovely and clean and were quiet as we went in December. We had a car to get around as this hotel is not in the centre of the strip, takes from 5 minutes to 10 minutes to get to the centre, good for driving to Pahrump avoiding all the strip traffic. We stayed here for a weekend and had a blast. South Point truly has everything - bowling alley, equestrian center, movie theater, 11 restaurants, 6 bars, pool, spa, shows, gambling and more! We were planning to check out the strip, but quickly found there was no need to leave the hotel. Anyone staying at the hotel gets a coupon book full of great deals that funded our fun and dining. Just don't forget about the $20 resort fee! This was my 3rd time here and I clearly like the place, but I did leave this time thinking it is overdue for an upgrade. It is a nice place to stay with friendly staff and good facilities. The food options are good, but food quality is not great - it is good value for money though. I like the relaxed and less pretentious atmosphere but would look for somewhere different next time to stay that is a bit more modern.